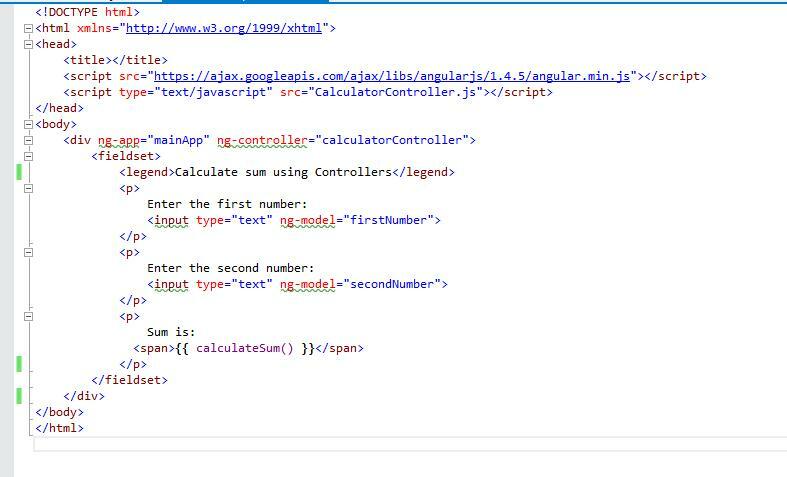 Here, the mainApp is the application level angular module and in this module we add or register a controller named calculatorController. The controller function accepts two parameters, where first one is the name of the controller and second represents the controller itself, with functions and properties we will use. Next, we simply need to bind this controller to the view. For this, we add an html page and add the reference to the external angular js using external reference. Also add reference to the external controller js file we created. Run the application and change the values and see the results. I think you wanted to write "Product is :" instead of "Sum is:"
Thanks for pointing it out Mohit, I have updated it. Jasminder - Just to clarify, your method calculates the product of two integers, not the sum. The sum of 2 + 3 is not 6.